The closet is perhaps one of the best places to get spring cleaning started. Attire can easily be sorted into categories like seasonal use, color, function, and how frequently you wear it. At the same time, it can be almost daunting to go through mountains of clothing and sort them all for keeping, storing, and getting rid of. So today, I’ll be taking us through some steps for organizing your closet. Purge your closet of old or unlikely to be used items. Something I’ve been really into lately is the KonMari method, where Marie Kondo helps people tidy up their homes and lives by keeping things that spark joy and getting rid of things that don’t. Go through your clothing and hold each item. Really ask yourself if it makes you happy. Do you feel unstoppable when you wear it? Does it hold immense sentimental value even though you know you can’t fit it? Then don’t let it go. Anything else can be tossed into a donation bin or sold. Cycle out your seasonalwear. You won’t (or shouldn’t) need a winter coat anytime soon. 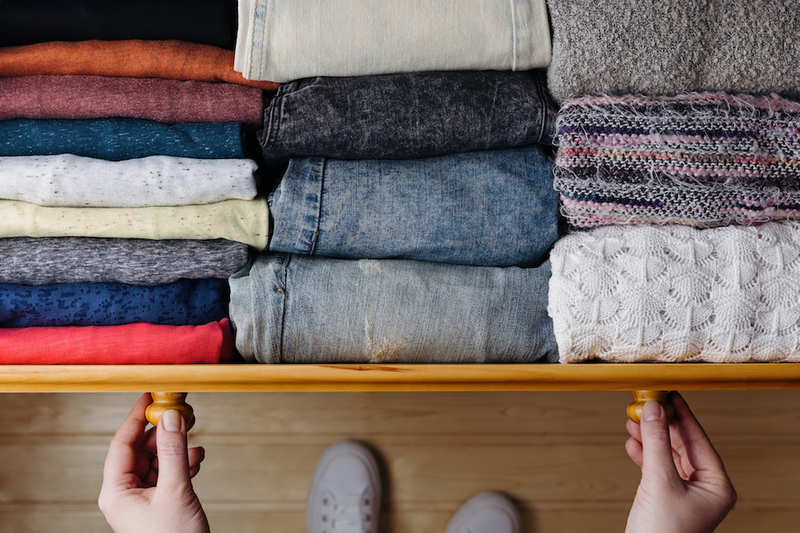 Put things like heavy coats, fleece-lined pants, and thicker fabrics in storage, and replace them with light-weight attire for the warmer weather. Categorize your organization. Whether it be color, use, style, or clothing type, organize in a way that you know you’ll be able to find what you need right away. Is it faster to find your favorite black jacket if it’s with all the other jackets you own, or with the other black attire you own? Make use of vertical space. Make your closet functional by including shelving and hanging spaces. Hang shorter attire like shirts, shorts, and tops above shelving, while pants, dresses, and longer jackets can hang above nothing. Display accessories in a unique way. Another part of Marie’s tidying method is to display your things in a way that sparks joy. Maybe use an interesting trunk or box to put some of your items in, and put your favorite item out on display for easy access and to make the space have visual interest. You’ll smile whenever you see it! Use storage baskets and other containers. Storage containers are a great way to keep your smaller items like purses, hats, and scarves organized and out of the way. Take advantage of closet organizers. An easy and quick way to get some organization done is purchasing a hanging shoe rack or hanger organizer. These items can also save space if used correctly in your closet. Unification of products. Make your closet visually appealing by using the same style containers, hangers, and boxes. Keep in mind that some hangers are made specifically for certain materials, so be mindful of which fabrics you’re hanging up! Fold your clothes to save space. Something I’ve seen firsthand is the way Marie folds all manner of clothing so that they stand up and are easily seen when opening your drawer. They look like well-organized files, and save much more space than folding them and stacking them on top of each other. Make use of wall space. If you don’t have pictures hanging up, maybe hang a jewelry or tie display on your wall or closet door. Apart from freeing up dresser space, this can make accessories easily visible and ready to grab exactly what you need. Have you done any closet cleaning recently? Leave your ideas in the comments section!